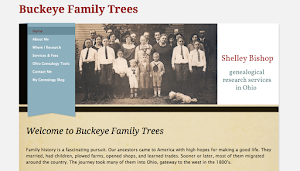 February can be rather gray month here in Ohio, so I’m excited that Lynn Palermo of The Armchair Genealogist is offering her Family History Writing Challenge again this year. I participated last year, and while I faltered a bit toward the end, I appreciated the focus it brought to my writing efforts. It’s easier to make writing a family history story more of a priority when you have daily support, encouragement, and tips, which Lynn and her guest authors provide in abundance. I’ve decided to take Lynn’s challenge again this year. That means I’ve got a few days to finish selecting a primary subject to write about, out of so many swirling around in my head. (I can almost picture my ancestors jumping around, their arms waving, calling, “Pick me! Pick me!”) So I might settle on doing a few short vignettes as well, some of which should appear on this blog. For the month of February, I’m going to focus on stories, rather than resources, tips, or technology, here at A Sense of Family. Stories take more time to write, but they linger with me longer and give me greater satisfaction, too. I’m particularly looking forward to the line up of guest authors that Lynn has scheduled this year. Lisa Alzo (The Accidental Genealogist), Biff Barnes (Stories to Tell), Sharon DeBartolo Carmack, Mariann Reagan (Into the Briar Patch), and Tami Koenig (Your Story Coach). Plus Q & A interviews with Denise Levenick (The Family Curator) and Ryan Literall. Who could help but be inspired by that group? 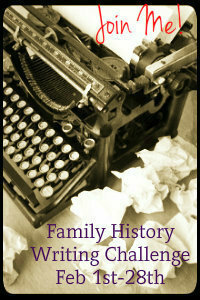 If you’re interested, there’s still plenty of time to join the Family History Writing Challenge. Just head over and sign up for Lynn's emails. You don’t have to have a blog to participate. You can write privately, in any format that’s comfortable for you (I’ll be writing privately for the most part, as part of a larger project). If you do have a blog, though, be sure to pick up a badge like the one above. Have you joined the challenge? Leave me a comment, and a link if you'd like, so I can follow along with you. Let’s keep each other company this February! I recently discovered that the good people at FamilySearch have added to their online collection of Ohio birth records. Their “Ohio, County Births, 1841-2003” database was just updated on January 16, 2013, with images from several more counties. This database now contains 3,556,062 records—a fantastic resource for finding births of Ohio ancestors, particularly those born between 1867 and 1908. I’ve been playing around with the database a little bit, and have discovered some quirks, which I thought I’d share with you. First of all, the name of the collection is a bit of a misnomer. 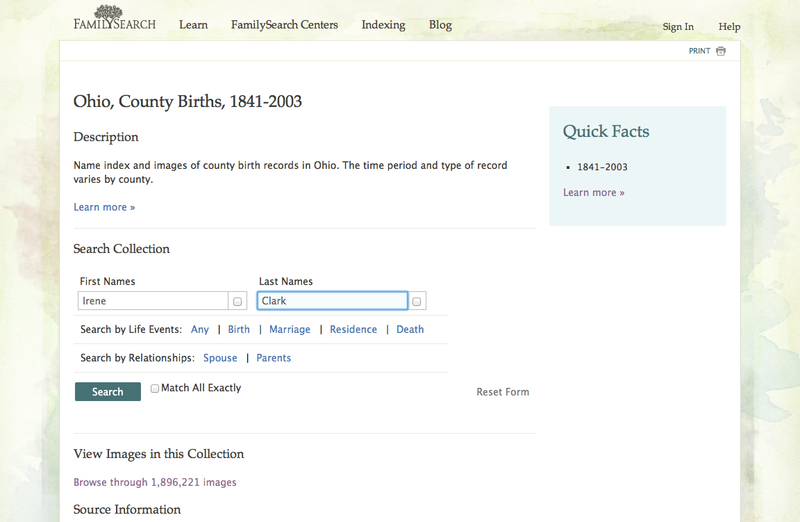 Even though it says “1841-2003,” the vast majority of the images are from old county birth registers created prior to the time Ohio started requiring state registration of births and deaths in 1908. Here’s where a bit of history comes in handy. In Ohio, the counties were first directed to start keeping registers of births in 1867 (Ohio has 88 counties, so that’s a lot of registers). As you might imagine, compliance with this new-fangled law was neither immediate nor complete. Some counties, such as Franklin County—home to the capitol, Columbus—relied on tax assessors to gather birth and death information from people as they were making their tax collection rounds. I can only imagine how happy people were to have the tax collector at their door asking about such things! A big problem with this method is that people who didn’t own property were often overlooked. Also missed were people who had moved away during the year. In short, there were a lot of holes in this system. In other counties, doctors reported births, sometimes in one big cluster whenever they got around to it. This could be weeks or even months after the birth took place. 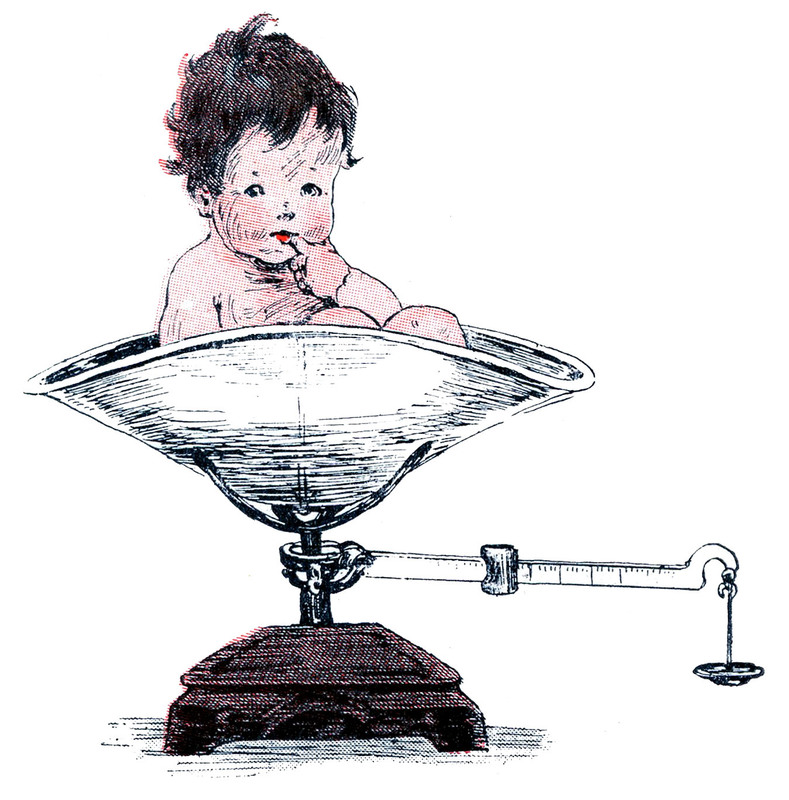 The counties’ burden was lifted in December 1908, when the state took over the job of registering births and deaths. So if you click on “Ohio, County Births, 1841-2003,” and then on “Learn More” in the right-hand sidebar, you’ll find a statement that says, “This collection covers the years 1856 to 1909.” That gives you a better idea of what you’ll actually find in the database. As a bonus, it also includes more recent delayed birth registrations for some counties (generally 1940s-1960s). But back to the database home page. 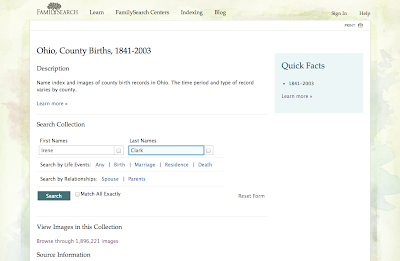 Naturally, the search box is the place to start looking for the birth record of your Ohio ancestor. Be flexible and try different spellings—these names were taken from faded and sometimes damaged handwritten register books. Using the asterisk symbol (*) to stand in for some of the letters can help. Also, unless the name is a common one, I usually don’t enter a date or location as a search term to start. If you find what you’re looking for, you can see and print the image of the actual birth register. Most of these span two pages, so be sure to click on the arrow to check the next page. Take a moment to think how cool that is, to be able to find your Ohio ancestor’s birth record from over 100 years ago in mere minutes! But if you don’t find what you need, don’t give up. A recent blog post by the Ohio Genealogical Society observed that this collection does not seem to be fully indexed. Which means not everything will show up just by doing a name search. So what’s the next thing to try? Browsing. Click on “Browse through 1,896,221 images” on the database home page. You’ll be taken to a list of the counties for which records are presently online. Click on the county you want and see what’s available. Some larger counties have separate index books. If not, you can check the index at the front of each volume. Find the index page for the first letter of the surname, and see if your person is there. If he or she is, it’s simply a matter of getting to the right page in the book. The collection is not yet complete, as a few counties (including Geauga) have no records. I hope that in time they’ll be added, too. FamilySearch also has another database called “Ohio Births and Christenings, 1821-1962.” It doesn’t have images of the actual records, but can be a great finding aid. And at over 2.5 million records, it’s not too shabby, either. Are you looking for an ancestor who was born in Ohio? Here's wishing you success with this new resource! I’ve had several pleasant surprises in the past week or so as A Sense of Family has been nominated for two blog awards. I’m delighted and honored to have been selected for these awards by five fellow bloggers whose work I enjoy. What a nice way to start off the new year! 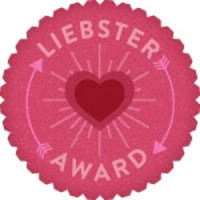 Jana Last at Jana’s Genealogy and Family History Blog nominated me for the Liebster Blog Award. Liebster means "friend" or “dearest” in German, and the little heart insignia reminds me of a piece of folk art. Thank you, Jana, for this honor. If you aren’t already a regular reader of Jana’s blog, you’ll want to be sure to check it out. She does a terrific job of finding interesting posts to highlight each week on her “Follow Friday—Fab Finds” posts, and shares some great Sepia Saturday photographs and travel stories with her readers. I was also kindly nominated by Margel, who writes 2338 W. Washington Blvd. Margel’s posts about her family history adventures are always a delight to read, warm and full of her natural good humor. You can tell you’re in for a treat just from her “About Me” profile, where she says, “If I ever win a fortune in the lottery, I will travel the world and hire someone else to clean my house.” Now there’s a woman after my own heart! A third nomination for the Liebster Blog Award came from Linda Huesca Tully of Many Branches, One Tree. That’s a great name for a family history blog, don’t you think? Linda wrote that she has just discovered my blog, for which I’m grateful. Now I’ve discovered hers as well, and am enjoying her loving memories of family members. Mariann Regan of Into the Briar Patch recognized me for the Wonderful Team Member Readership Award. The creator of this award wrote, “As bloggers, we are also readers. That is a part of blogging as listening is a part of speaking.” Thanks, Mariann, for this nomination. It seems especially fitting, as Mariann herself is such a loyal reader, frequently leaving thoughtful comments and gracious words on my posts. Her blog is relatively new, but she’s taken right off with it, as you can see by her recent thought-provoking post on Boone Hall Plantation. I’m grateful as well to Jacqi Stevens of A Family Tapestry, who also granted me the Wonderful Team Member Readership Award. Again, I could just as easily flip this around, because Jacqi herself is such a supportive commenter on my blog. I recently wrote about how she inspired me to come up with A Kinder, Gentler Approach to Genealogy Goals. Currently Jacqi is going through a stash of inherited photos and writing about her discoveries—an interesting series that gives me ideas about how to approach some photos of my own. 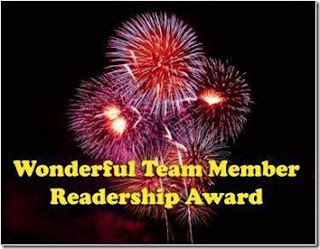 Thank you not only to these bloggers, but to all my readers. I’m grateful for each and every one of you. An extra thanks goes out to those who take the time from their busy days to write a comment when something I’ve written has helped, inspired, interested, or touched them. Both of these awards ask recipients to nominate other bloggers in return. But in the interest of time, that part is going to have to wait until another day. I read and enjoy so many great blogs that I’m finding it nearly impossible to single out just a few. 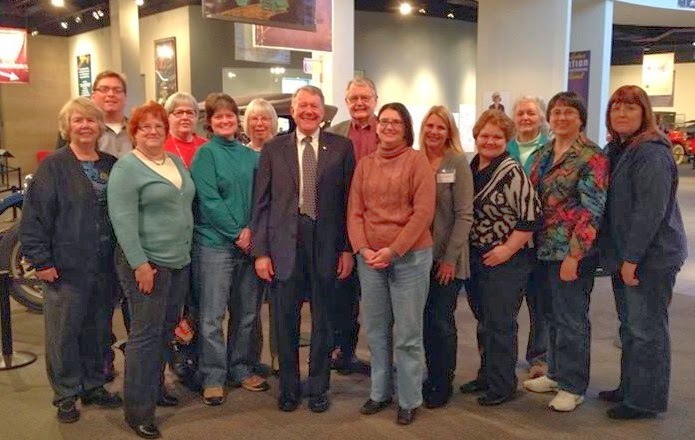 We are a lucky community to have so many people dedicated to sharing their family history discoveries and genealogical knowledge for all to benefit from. I’m just glad to be a part of it. It seems like these three things go hand-in-hand, doesn’t it? We start the new year with a blank slate, dreaming of all the glorious things we might accomplish. And we have every intention of making those things happen. But after awhile, the twists and turns of real life tend to lead us in other directions. At the end of the year, we’ve actually done quite a lot. But it somehow doesn’t seem as satisfying as it should because we can’t check off the boxes on all the goals we set 12 months earlier. For the past two years, I’ve posted my annual goals here at A Sense of Family (see “Going Out on a Limb” in 2011, and “Going Out on a Limb Again” in 2012). But this year I’m taking a different approach. I’ve been inspired by Jacqi Stevens, author of the blog A Family Tapestry. 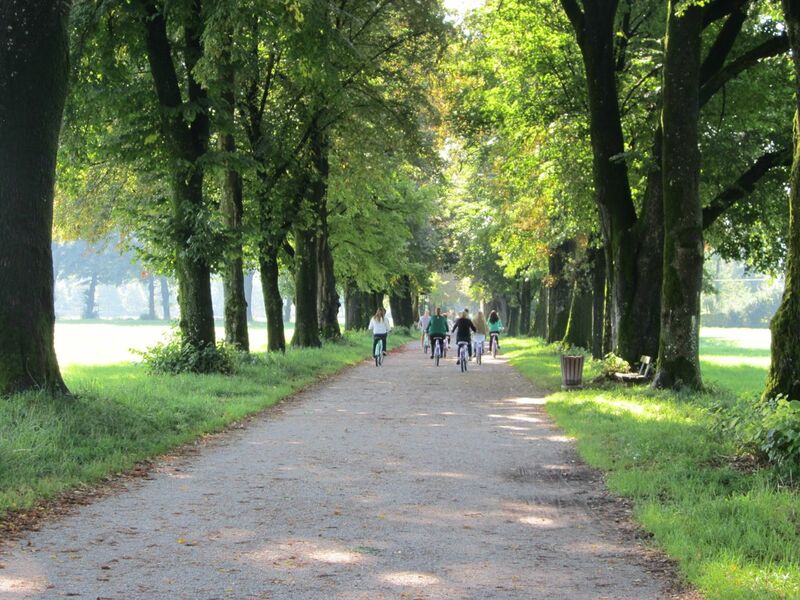 Her recent post, “What Happens Tomorrow,” is a good reminder that even though we can’t see the road ahead, we can still have productive and satisfying days. And that, like the old tortoise-and-hare proverb, a slow and steady pace can be just the ticket for finishing the race. If you haven’t already, take a few moments to read what Jacqi has to say. 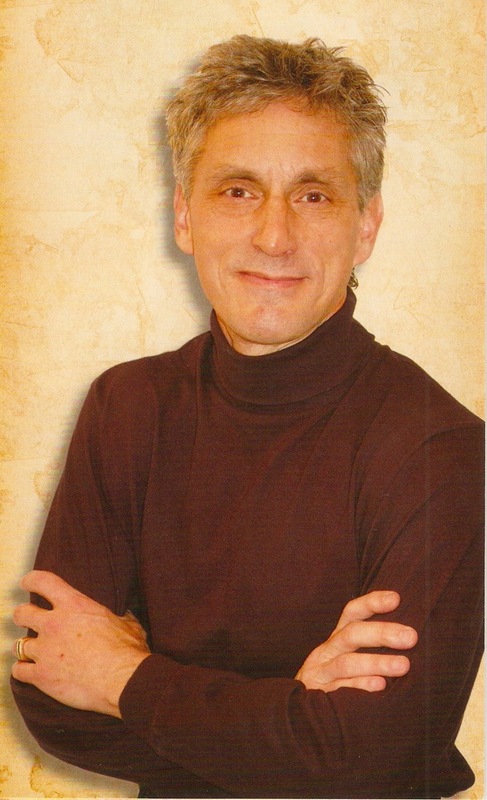 I’ve also been inspired by Lynn Palermo, The Armchair Genealogist. Her recent post, “Achieving Your Family History Goals by Taking Inventory!,” encourages us to clear the clutter away in order to see what we have and what we need more of. This makes a lot of sense to me. Some families on my tree are pretty robust, while others have gotten pushed to the back, patiently waiting for my attention. Looking at an overview of my pedigree chart reveals where I’m missing information. Just knowing where these gaps are, and recognizing what information I need, is a big help in moving forward. Clarity. If that sounds like something you could use, too, I highly recommend you read Lynn’s suggestions for dealing with clutter and taking inventory. So this year, I’m not posting my usual list of goals and objectives. I’ve decided to take a kinder, gentler approach. You see, like many of you, I don’t have big chunks of time to do my personal genealogy research. Life is busy. Between my work, family, home, and volunteer activities, every day is full to bursting. Time management is an ongoing challenge. When I do get a chance to work on my own ancestors, it tends to be in small bits of time. And it helps to know what I’d like to focus on, so I don’t lose that precious time. Instead, I did a quick inventory of my genealogy database to determine where my biggest holes are. Then I jotted down reminders of some unanswered questions so I can pick up and run with them when I get the chance. Since I don’t expect to solve all these mysteries, I won’t be disappointed if some of them linger on at the end of 2013. But when opportunity arises, at least I’ll have a list of “needed items” ready to search for. Who were the parents of Charles Ballenger, who was born in 1815 and appears in the 1840 U.S. Census taken in Athens County, Ohio? Where did Charles come from? Where and when did he marry his wife, Elizabeth Jane Adams? Who were the parents of Samuel A. Seely, born in 1863 in Rushville, Indiana? When and where did he marry his wife, Matilda Adeline Wright? Who were her parents? Undocumented family history notes written by my husband’s grand-uncle shows George Crites as the father of Jonathan Crites, born in 1829 in Pennsylvania. What evidence can be found to confirm and document this relationship? Who were the parents of his wife, Eliza Ellen Lucas? When did Ludwig Schiebel immigrate to America, and when and where was he born? What else can be learned about him and his wife, Pauline? I’m hoping these notes will give me just enough focus to continue making steady progress in finding my ancestors. It’s a more flexible approach than I’ve used in the past, but it feels comfortable. I don’t think there’s a right way or a wrong way to set goals, and you may prefer a more structured method. But whatever you do, remember to sit back and savor the achievements—large and small—that you make during the course of the year. Imagine your ancestors thanking you for all your hard work. After all, it’s the journey that counts. Be kind to yourself, and make it a fun one!